Last week I showed you my embarrassing 'before' pictures (along with the much nicer 'after' pics too!) of my crafty workspace. 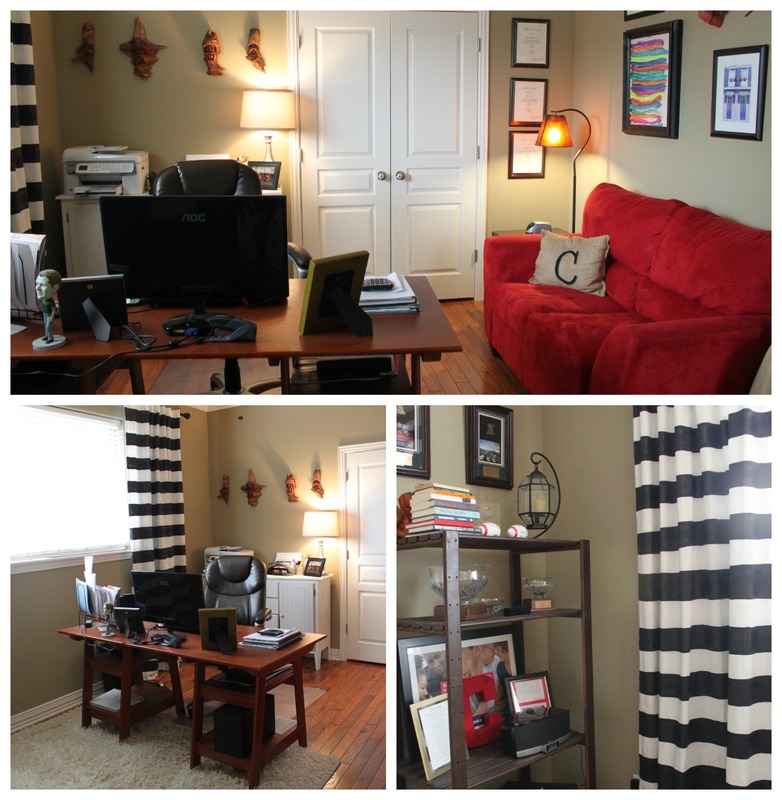 Well, after getting my craft room all cleaned up, I set my sights on my husband's office. Back in September of 2011, you may remember that this was a major project in our home. 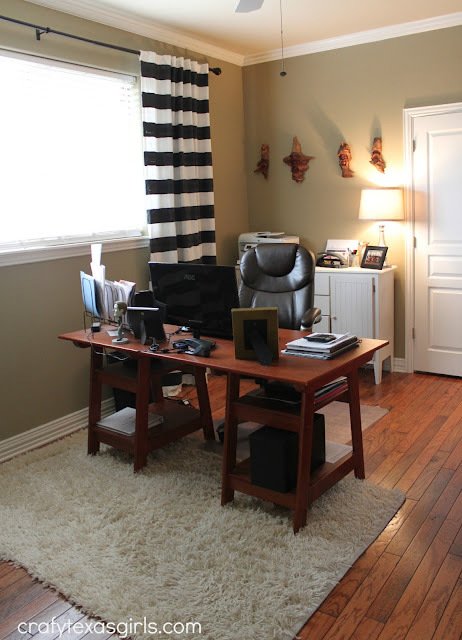 Since my husband actually offices from home, our 'home office' can't just be a pretty room that we use for checking email and paying bills. It really has to be practical. The room was originally designed as a 'mother in law suite'. It is a nice big bedroom downstairs, with its own private bath. Both the girls used it as a nursery when they were little, which was wonderful because it meant I didn't have to run up and down the stairs in the middle of the night. But as the girls got a bit bigger, we moved them both upstairs. And Jeff inherited the spacious room with the pretty hardwood floors. Want to know about that red couch?! Hint: always buy neutral furniture. And read this post here! To give the room a new look, I painted curtains (see the tutorial here), hung them correctly (see tips/tricks for curtains here) and reorganized the entire space. We pulled in the shag rug to replace the colorful striped one. And created a gallery wall to showcase personal photos and the kids art work. All the details about the office make-over can be found here. But after a busy year or so, the room needed a little tweaking. Mostly just tidying up. And a new piece of furniture. Can you spot it? THE NEWEST VERSION of "AFTER"
Yes! The new office chair! I am still really happy with the look of this space. But I felt the room needed a small change. A bit of cleaning, straightening, and a new chair. I think the leather looks more masculine and cleaner than the previous burgundy upholstered one. This new office chair is from Staples.com. 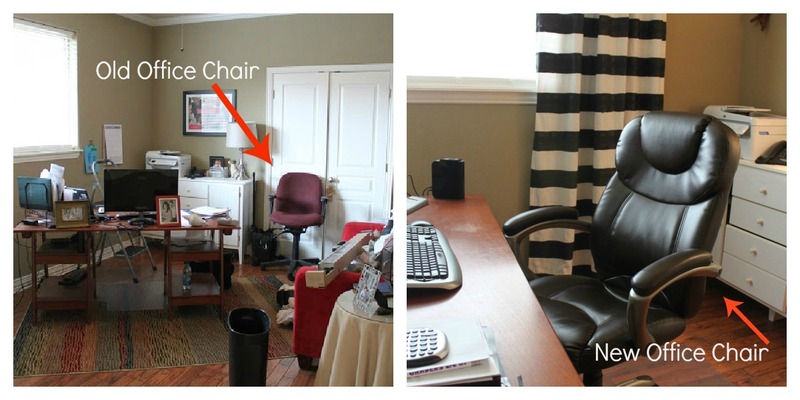 One new chair can make a big difference! Affordable room updates can take many forms. In my craft room, it was the Elfa organization center. In this room, it is a new leather chair. Furniture can be a great way to update a room! Find a piece-- like a chair, dresser, or end table--and you will quickly find yourself with a brighter room. You don't necessarily have to spend a fortune (remember sweet Maisy's thrifted bed!) and it may take little patience, but eventually you can pull that room together! What would you like to update in your home? I was not financially compensated for this post. I received a sample from Staples.com for review purposes. The opinions are completely my own based on my experience. It's coming along great, Samantha! I love your little Cypress carvings. I have no clue what they're called, but I inherited one from my Dad. I love its little wrinkled face. :) I've never seen anyone with one until now - and you have four. :) Can't wait to see the finished room! Looks clean and ready for work! I love the new chair and you can never go wrong with leather. I have been searching for new chair that hubby and I will agree on. He wants something comfy and larger and I want some pretty and dainty. I think he is going to win this one.